Limited Sedition is preparing the first two entries in a series of releases documenting Matthew Sperry’s unreleased music. The first is a solo bass cd and the second is a quartet recording with Sean Meehan, Scott Rosenberg and John Shiurba. Information will be available at www.limitedsedition.com later this week. John is trying to get the first two ready for the memorial concert on Thursday. Update: We previously did not have a direct link to the page describing the project. Now we do. Anyone with recordings should e-mail John and let him know what they have. The hope is to release what’s releasable, and to at least make copies of anything interesting for Stacia and Lila. Wonderful piece (scroll down destination page for article) in today’s Oakland Tribune on Matthew’s death, on the shivah that ended last night, the memorial funds, the upcoming concert, and Sam’s dedicated work standing at the accident site with a sign, seeking witnesses. The story quotes visitor comments from this web site. mausoleum replete with gardens, fountains, and stained-glass skylights. The program will feature simultaneous performances in different parts of the building by Bay Area composers, musicians, and other performers presenting a variety of acoustic and electronic music, installations, and interactive events; the audience is free to move throughout the building during the performances. This year’s event is especially poignant for many of us in the improvisation/new music community, having just lost our wonderful friend, Matthew Sperry. The Chapel of the Chimes was one of his favorite places, and his family has chosen to place some of his ashes there. The following press release went out today. Please distribute far and wide. 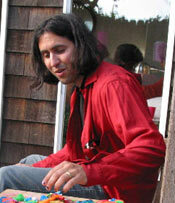 OAKLAND, CA – June 13, 2003 – Matthew Sperry, a well known local musician and performer, was struck down by a truck while riding his bicycle at approximately 9:00 a.m. – 9:30 a.m. on Thursday, June 5th at the intersections of Powell and Vallejo Streets on the Oakland/Emeryville border. Oakland Police are still seeking eyewitnesses to the accident. Anyone with information can also call (510) 594-8270 or e-mail SBILTEKOFF@aol.com. A press release went out on PR Newswire today promoting Matthew’s upcoming Memorial Concert, which means it shows up on Yahoo! and lots of other sites. The concert is scheduled for June 19th, 2003 in Oakland. Please distribute this far and wide. Matthew’s memorial service was held at the Chapel of the Chimes in Oakland yesterday. We should all live our lives such that the people around us are inspired to throw such a remembrance when we pass. I have never been to a memorial like this — great musicians from all over the country came to play things they had played with Matt before, to improvise, to speak, to remember, to pray. Parents, siblings, friends voiced their feelings. Stacia spoke courageously. The cast of Hedwig played two songs from the show, which left everyone with Kleenex in hand. Little Lila was hoisted on shoulders to see friends and family clapping to Klezmer music. I held small sleeping Miles in my arms and felt so grateful for his existence, our relationship. Friends showed their love for one another. We all cried, and started to move through the wall toward acceptance of Matthew’s loss. At the end of the service, we saw Stacia smiling a bit – the first time in days, so gratifying. The world has lost a shooting star. Matthew Sperry was hit by a car while on his bicycle this morning, and left this earth shortly after. In addition to being a wonderful father to two-year-old Lila Simone and husband to our good friend (and doula) Stacia, Matthew was an incredible bass player, a rising star who appeared on Tom Waits’ last two albums (and an accompanying David Letterman show), the last Anthony Braxton record, David Byrne’s “Feelings,” a fantastic Black Cat Orchestra recording called “Mysteries Explained,” and on and on. His resume tells the story. Matthew also played bass / chorus member for half a year in the San Francisco production of Hedwig and the Angry Inch, not because it paid well, but because he loved the story, loved the outrageousness of it all. 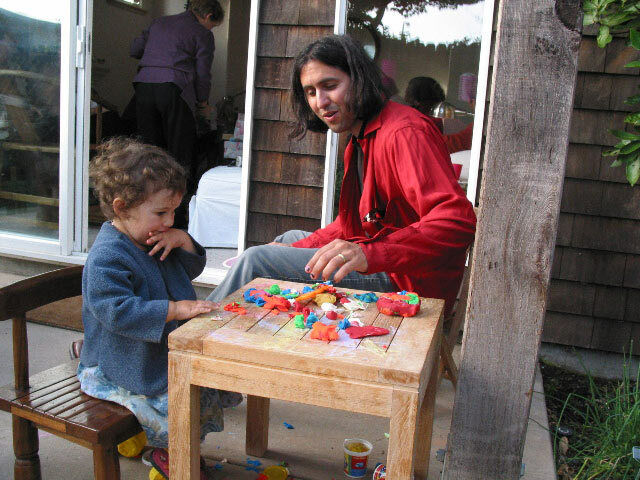 Even if it meant having black fingernails and traces of eyeliner by daylight for months on end (check his fingernails in the play-dough image below). I’ve got one of Matthew’s older avante garde recordings with an outfit called “Impossible Underpants” (his comment denying that Impossible Underpants ever existed is here), and Matthew’s bent for comical strangetude is all over it. Matthew was also the mastermind behind Los Platanos Machos Quattros, the four-piece guitar outfit we put together for Roger’s 40th birthday, just to create and sing one song. Matthew was a trip, relentlessly creative. 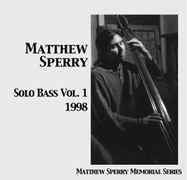 I also have a CD by “The Matthew Sperry Trio,” only Matthew isn’t on it — it’s a quartet comprised of musician friends of his, who just wanted to name themselves “The Matthew Sperry Trio.” Inside, the liner notes are plastered with pictures of him as teen idol, pinup boy, clean-shaven, short hair. The centerfold pictures him naked, holding a stuffed frog. This is how Matthew affected the people around him – his sweet, slightly surrealistic sense of humor was inspiring and contagious. As Amy said, when he saw you, he hugged you, and he hugged you good, like he was really really happy to see YOU. He called me once while sick, flat on his back, just to chat, reaching out toward friendship even at his lowest. He worked so hard to feed his family, was always so full of good cheer and crazy ideas. I can’t believe he’s gone. Nothing anyone can say or do can rewind the moment, change the fact that a shining star has blinked out for good. Seeing his giant standup bass cases around Stacia and Lila’s house today was hard. Larger than life, they stood in corners like proxies for Matthew, just hanging out with us, maybe laughing, maybe plucking, slapping, sawing at their own strings. I don’t have any good pictures of Matthew playing, but here’s a good one (playing with Dan Plonsey — a Bay Area composer and improvisor with whom Matthew played often — they shared a strong aesthetic). Our hearts go to Stacia and Lila, who have the hardest road of grieving in front of them. 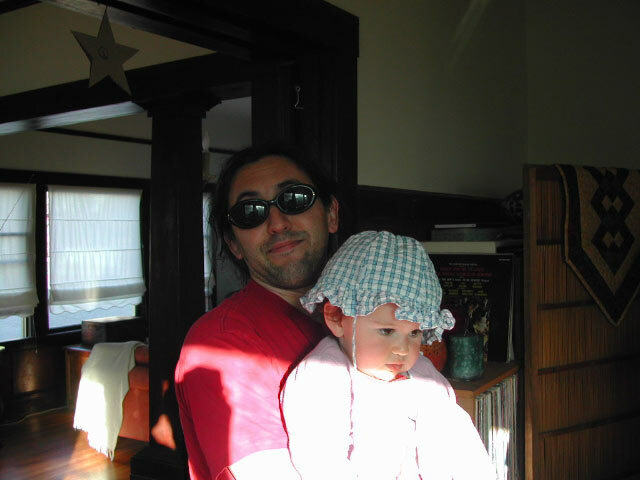 I hope that Lila is old enough to one day have a glimmer of memory of her wonderful father. How do I know that the dead do not wonder why they ever longed for life? We pray that Matthew is at peace, happy, making amazing music somewhere. Updates: The Oakland Tribune ran a brief memorial piece on Matthew. The SF Chronicle had another. If you would like to leave flowers or memoria at the accident site, this map will get you there. Stacia’s friend Erika (who is being a rock through all of this, valiantly holding things together) asks any camera-oriented folk to please photograph whatever gets placed at the site. Bassist Mike Watt dedicated the encore of the final show of his “the cord that spun its own top” tour to Matthew. A memorial concert for Matthew will be held June 19 and all are invited. This information has gone out on the newswire. Matthew’s memorial took place Monday, June 9 at 1:00 in Oakland. A summary of the memorial service is here. The program guide can be downloaded in PDF format. If you are in the New York City area, a memorial will take place Saturday, June 14, at 4pm in in Park Slope, Brooklyn. Sheri Cohen plans to go to Volunteer Park in Seattle at 9:30 PM on Tuesday, June 10 to remember Matt. She invites all who would like to join her to meet at the ‘donut’ and all can go off to a quiet place together. LeapFrog, Matthew’s last employer, is setting up a college fund for Lila through Bank of America. Details are still pending and will be posted here as soon as they are available. 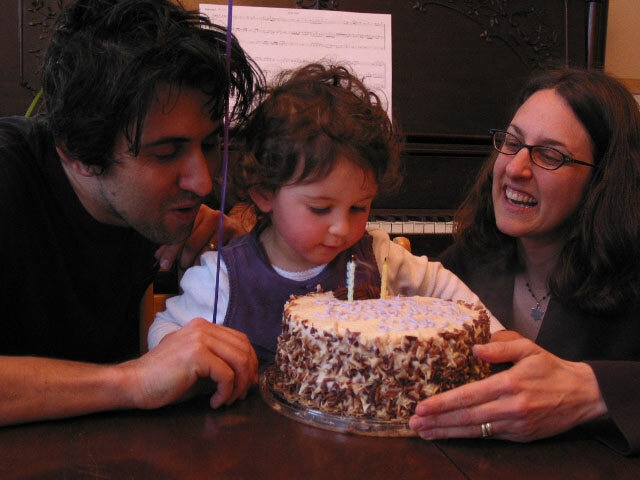 In the following days, Shiva will continue at Stacia and Matthew’s home. Please feel free to visit during the day. Stacia would love to see you. 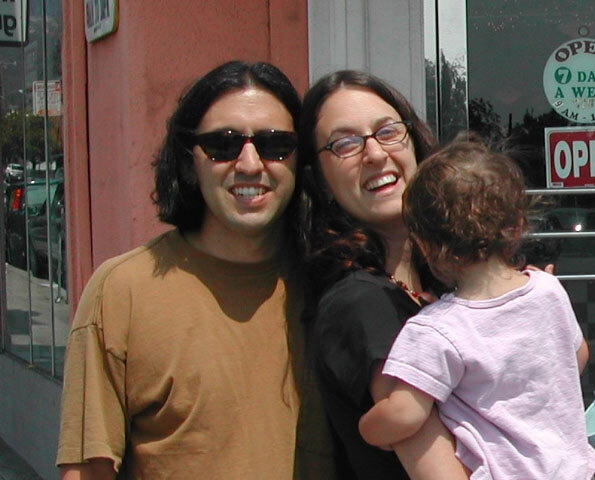 Shiva will end on Father’s Day, with a memorial walk leaving from Stacia and Matthew’s home at 4:00 p.m.